Trailing Four O'clock is a member of the Four O'clock (Nyctaginaceae) Family. It is a ground hugging plant that grows in mats to 10 feet in length. The hairy, oval shaped leaves are green on top and silvery underneath and grow to 2 inches in length. 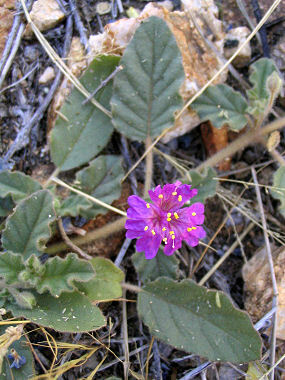 The plant typically grows along roads and in sandy clearings at elevations below 6000 feet. The leaves and stems of the Trailing Four O'clock are sticky. 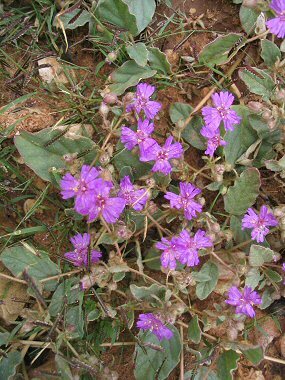 Trailing Four O'clock typically blooms between March - October and produces irregular pinkish purple flowers which grow in clusters of three to 1 inch in width.